If you’re in Portland, you must go to Salt & Straw for delicious ice cream!!! There are three locations in Portland; I went to the one on NE Alberta St (linked above). It was ~90°F and humid- perfect for ice cream! The line went out the door but it moved rather quickly. I decided to go with their popular flavor, sea salt ice cream with caramel ribbon, and opted to go with sea salt toppings. 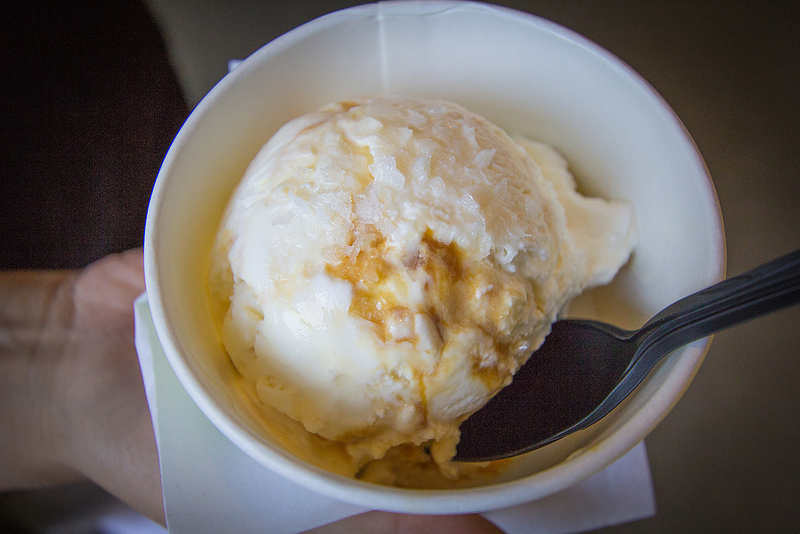 The sea salt toppings helped balance the caramel flavor. All together, it was very bold, sweet, and salty! This isn’t your typical supermarket-chain ice cream with standard sprinkles. This one is ice cream to a whole new level! Salt & Straw also has house-made waffles (I prefer cups), sundaes, ice cream floats, milkshakes, and even draft beverages. I’ve never heard of an ice cream parlor selling beer! Oh, and if you get your ice cream the NE Alberta location, there’s a store next door that sells minifigures, pins, and other collectibles, that lets you browse while eating your ice cream albeit carefully!